Escada is the go-to runway collection for the well-polished modern day business woman with a Yuppie mindset. The luxury designer line certainly didn’t fall short with their Spring Ready-to-Wear 2018 collection. While it stayed true to the fine tailoring and sharp, clean lines that have become staples of Escada’s legacy, there were many refreshing new elements, including can’t-miss hues, sparkling embellishments and other youthful style accents. The collection stepped out of the board room to present a series of looks to suit many of life’s occasions; from ball gowns and shift dresses to graphic knit sweaters and ‘matchy’ pant suits. The collection starts off with a glorious pleated, sparkling gown then leads into a selection of timeless boardroom-ready looks comprising of scoop neck cardigans, ankle cropped pants, and bold accent colors. 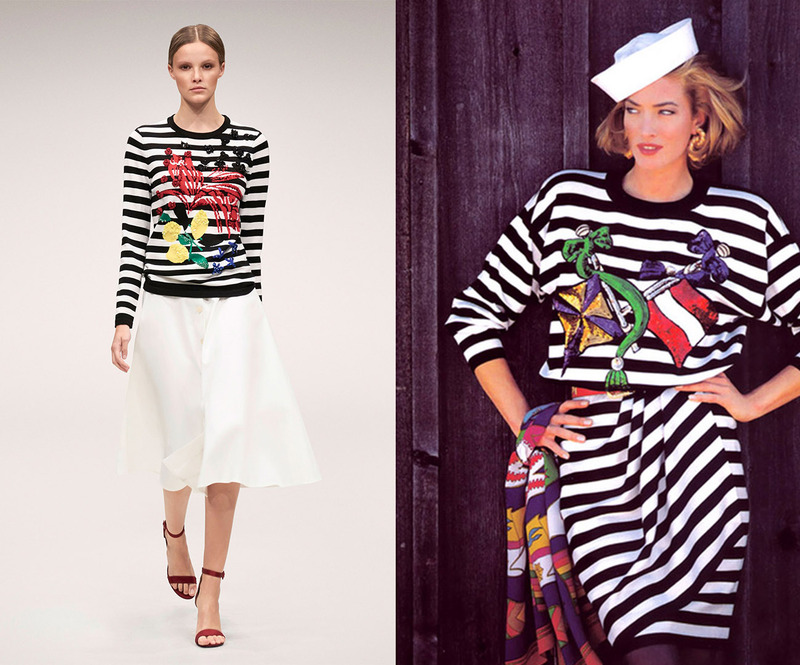 Color blocking and bold stripe accents are a clear staple of the collection from the very start. There’s also an effortless layering of blazers over cardigans and knitted sweaters that create a crisp look, especially when topped off with a cream track pant. The looks switch gears as we begin to see more beading and embellishment appear down the runway. Embellished jackets and sweaters — including the revival of a classic striped Escada top from 1992— add a bold edge to the line that is maintained in every look thereafter. Overall, the Escada Spring 2018 RTW collection is a highly wearable and sophisticated line that foreshadows some of the biggest upcoming trends for next season; bold color combos, playful pantsuits, and puffy silhouettes.